I can't believe it's been over two months since I've posted! It's a bit horrible how one busy day slips into the next, and into the next and so on...and suddenly there is no time for the things you love. Over the summer I took on a second writing job and the editor said she would pay me for as many stories as I could write. At the time it seemed frivolous to write for free here (no matter how much I love it) when a paying editor was waiting for my best foodie stories. 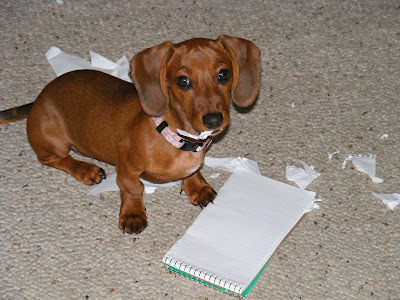 It was all writing, all the time, to the point that even our little puppy, Sadie, objected. Every time I set my laptop aside to consult my notes she would climb into the empty space. When I gently placed her back by the side of my leg, she would put her face mournfully on the corner of my laptop as if to say, "Really? This is what you want in your lap instead of me?" Just like a toddler, her behavior was worse when I was doing telephone interviews. And the shreds of my notes hanging from her mouth. Luckily, I had already filed the restaurant review she's eating here, because I'm pretty sure editors aren't any more sympathetic than teachers to the line, "The dog ate my homework." 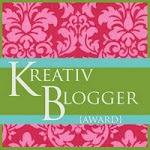 Despite Sadie's dismay at my writing obsession, I planned to get back to blogging right after Labor Day, but then things picked up at my day job (more writing!) and a new deadline imposed itself - the harvest season. This summer I doubled my garden space with the intent on canning or freezing all my extra produce to get us through the winter. It seemed like a good plan last spring and I spent every Saturday in June and July out in the garden. Unfortunately this past summer had to be one of the worst ever in New England. It never really got warm and rained every other day. It was a disaster for gardens and the whole Northeast faced a tomato blight that was all the talk at my local farmers market. My garden produced plenty of food for our daily needs, but not enough to can for the winter. Luckily my Mum and stepfather live in Vermont where there are more farms than stores so they brought me about 90 pounds of tomatoes, a bushel of peaches and many other fine things. Your dog looks adorable. I find it so hard to punish a dog who's just done something bad when they look so cute like this. What an adorable puppy! 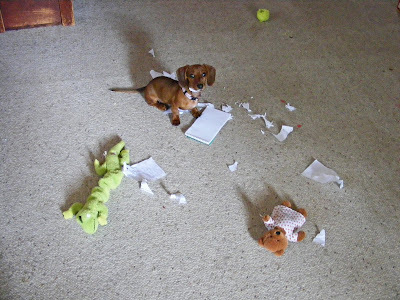 So naughty. 90lbs of tomatoes? My goodness! I can't wait to see what you did with all of it! Your jars look like jewels or stained glass windows. Just lovely. my pup does the same thing. she crawls on top of my laptop sometimes (note that she is a 42 pound english bulldog!) and she always looks at me as if to say "what on that screen is more interesting than me?!?!" 90 pounds of tomatoes and a bushel of peaches - amazing! You must have been very busy! back with a fever - nice looking canned goods. I cant wait to read the foraging post. Your dog reminds me of my son ;). 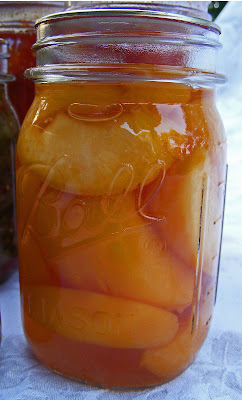 I really need to try my hand at canning. It looks like a lot of fun. 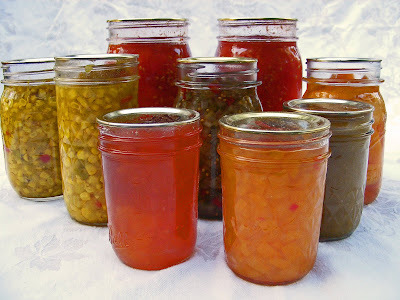 I think canning fever is a good kind of fever to have! Your puppy is just adorable! You have been busy! 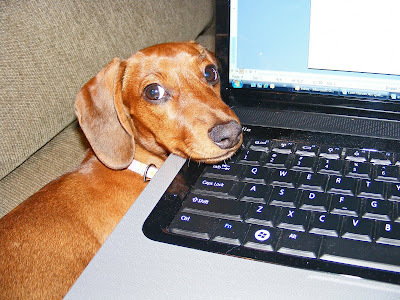 Nice to see you back blogging again and your puppy is quite the cutie!